Wardell showed an early interest in cooking, and in fact attributes Wardell's grandfather for furthering his career in this field. Wardell's grandfather owned Hardin's Bar-B-Que pit in Hitchcock, Texas from the late 30's to the early 50's. People came from Galveston and Houston, Texas to eat his chicken and ribs. Who else could be a better judge of his special sauce than Wardell's own grandfather? Wardell and his son flew to Hitchcock, Texas with a bottle of his Bar-B-Que sauce and his grandfather tasted and gave his Heart approval and Wardell was on his way. 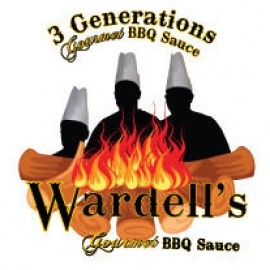 In 1987 Wardell and his family first introduced their Bar-B-Que sauce to Moreno Valley, California at the annual fair. The folks found it to be quite good and unique and wanted Wardell to open up a Bar-B-Que restaurant, Wardell liked the idea and began his plans to open his own Bar-B-Que restaurant. The year of 1987 had past and before he knew it the 1988 annual fair was back and Wardell decided to have another booth at the fair. People remembered him and flooded his booth proving to him and his family that his project would be a success in Moreno Valley, California. "Wardell's Sauce Makes the Difference"